Using computer simulation analysis, MIT researchers have developed a conceptual design for a half-sized gasoline engine that would be as efficient and powerful as the full-sized diesel engines now used in heavy-duty trucks—without their high emissions of air pollutants and greenhouse gases (GHGs). The small, highly turbocharged, spark-ignition engine gets an extra boost from injected alcohol when it needs to work hard to move a heavy load, especially while accelerating or climbing a hill. The computer analyses show that the gasoline-alcohol design could slash emissions of nitrogen oxides by 90% and also increase power by up to 50%. Cutting the injected alcohol by mixing it with water or making other changes could reduce alcohol consumption. But if reducing GHGs is a priority, the engine could instead run on 100% ethanol or renewable methanol. The engine requires modest changes to an existing engine, so it could come into commercial use quickly and at lower cost than comparable diesels. Powered largely by diesel engines, those trucks are now the largest producer of nitrogen oxide (NOx) emissions in the transportation sector, contributing to ground-level ozone, respiratory problems, and premature deaths in urban areas. Some estimates project that diesel fuel—used for both trucks and cars—will out-sell gasoline worldwide within the next decade, threatening to further increase already-severe urban air pollution as well as GHG concentrations. Cohn and his colleague Leslie Bromberg, principal research engineer at the Plasma Science and Fusion Center and the Sloan Automotive Laboratory, have designed a replacement that should be not only cleaner but also lower-cost and higher-performing—and could be introduced into the fleet of vehicles on the road soon. Within the United States, pressure on the trucking industry to deal with diesel emissions has been mounting. Indeed, expected regulations in California would require that NOx emissions from medium- and heavy-duty trucks be cut by about 90% relative to today’s cleanest diesels, which use complex and expensive exhaust treatment systems just to meet current regulations. In some parts of the world, such as India and China, those cleanup systems aren’t generally used. As a result, NOx emissions are about 10 times higher, and getting them down to the level of future California regulations would require a reduction of about 98%. To avoid the challenges of dealing with natural gas, Cohn and Bromberg decided to pursue another approach: a heavy-duty SI engine fueled instead by gasoline. In general, gasoline SI engines produce low NOx emissions. 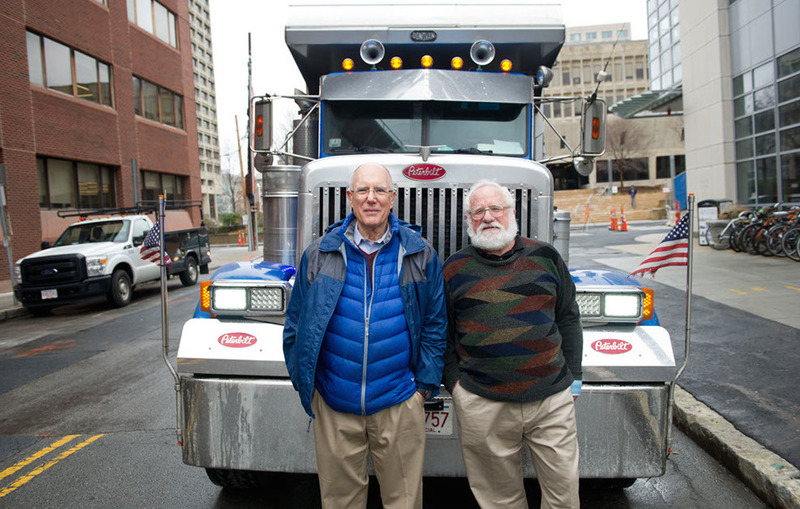 Guided by their computer models, Cohn and Bromberg took a series of steps to increase the power and efficiency of that design—without sacrificing its emissions benefits. A quick overview of the processes inside an engine will help clarify the changes they made. During normal operation, burning of the air-fuel mixture in the engine cylinder is started either using a spark or—in a diesel engine—by compressing the combustion gases until they spontaneously ignite. The burning gases then push down the piston, and a system of rods translates that downward motion into a rotational force called torque. Aided by gears in the transmission, that engine torque turns into torque at the wheels. Increasing the engine torque or running the engine faster—or both—will increase power at the wheels. Inside a typical gasoline SI engine, that process progresses smoothly—until there’s a need for high-torque operation. Then, pressures and temperatures inside the cylinder can rise so much that the unburned combustion gases spontaneously ignite. The result is “knock,” which causes a metallic clanging noise and can damage the engine. The need to prevent knock has up to now limited improvements in efficiency and performance that would be needed for gasoline engines to compete with diesels. The researchers also made use of an important feature of the low-NOx heavy-duty SI engine fueled by natural gas: They assumed that the mixture of air and fuel inside their engine contained just enough air to burn up all the fuel—no more, no less. That “stoichiometric” operation permitted important changes not possible in the diesel, which must run with lots of extra air to control emissions. With stoichiometric operation, they could utilize a three-way catalyst to clean up the engine exhaust. A relatively inexpensive system, the three-way catalyst removes NOx, carbon monoxide, and unburned hydrocarbons from engine exhaust and is key to the low NOx achieved in today’s SI engines. Then, given stoichiometric operation combined with a higher level of turbocharging and a high compression ratio, the researchers were able to shrink their whole engine. The SI engine doesn’t contain all the excess air that’s in a diesel, so the total volume of its cylinders can be smaller. “Because of that difference, you can replace a diesel engine with an SI engine about half as big,” says Bromberg. Taken together, the low-cost three-way catalyst and smaller overall size help make the gasoline-alcohol engine less expensive than the cleanest diesel engine with a state-of-the-art exhaust cleanup system. Indeed, according to the researchers’ estimates, the cost of the gasoline-alcohol engine plus its exhaust-treatment system would be roughly half that of the cleanest diesel engine. For the comparison, they used an illustrative version of their engine based on a 6.7-liter engine that’s now manufactured and could—with relatively small alterations—be converted to the gasoline-alcohol configuration either at the factory or after being sold. To keep the conversion simple, the design calls for injecting the alcohol into the cylinder through the standard valve but with the valve wide open. Direct injection into the cylinder would provide greater knock prevention but would require drilling a new hole in the cylinder—hardly a simple conversion. Using a new model of knock developed by Bromberg, the researchers confirmed that the knock resistance from “open-valve” injection isn’t quite as high as from direct injection. “But it’s a good compromise in order to get the engine introduced into the fleet more quickly,” says Bromberg. This table compares the 6.7-liter gasoline-alcohol SI engine to a 12-liter diesel engine on several fronts. The compression ratios and engine torques are about the same in the two engines. But the SI engine can run far faster than the diesel can. (Combustion is faster with spark ignition than with the compression ignition used in diesel engines.) Because of the faster operation and the roughly equivalent torque, the small engine can produce 460 kilowatts (kW) of power as opposed to 323 kW from the diesel—an increase of almost 50%. 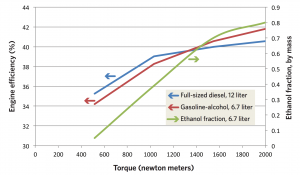 Changes in efficiency and ethanol use as torque increases This figure shows engine efficiency at various levels of torque (rotational force) in the 12-liter diesel engine (blue) and the 6.7-liter gasoline-alcohol engine (red). The efficiencies of the two engines are comparable, though the gasoline-alcohol engine is somewhat less efficient at lower torque and more efficient at higher torque. Not surprisingly, the amount of ethanol used in the gasoline-alcohol engine (the green curve) increases with increasing torque, as pressures and temperatures inside the cylinder rise and more alcohol is needed to suppress knock. 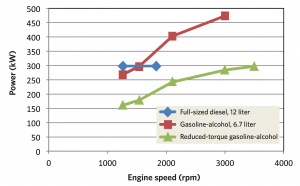 The figure above shows how the gasoline-alcohol engine fares in terms of efficiency as torque increases. The blue curve represents the 12-liter diesel engine, the red curve the 6.7-liter gasoline-alcohol engine (assuming direct injection of ethanol and a compression ratio of 14). The engines are assumed to operate at the same speed: 1800 revolutions per minute (rpm). The gasoline-alcohol engine is somewhat more efficient than the diesel at high torque and less efficient at low torque, but in general the small SI engine is about as efficient as the diesel. The green curve shows consumption of alcohol—here assumed to be ethanol—at different levels of torque. As more torque is required to pull a heavy load at high speed, up a hill, or during acceleration, knock becomes more likely, so more ethanol is needed. At the highest torque, about 80% of the total fuel must be ethanol to prevent knock. That estimate raises a concern: In the United States, ethanol is widely used in a low-concentration mixture with gasoline, but pure ethanol or a high-concentration ethanol-gasoline blend may not be available or may be too costly. So how much ethanol is likely to be required for a given trip? As an example, the researchers considered a trip taken by a long-haul, heavy-duty vehicle that requires high torque most of the time. Assuming a compression ratio of 14, ethanol would make up about 40% of its total fuel consumption. Lowering the compression ratio to 12 could cut that ethanol use by about half. In contrast, a delivery truck might operate at low torque most of the time and do just fine with ethanol as 10% of its total fuel over a driving period. Another approach to reducing alcohol use—called upspeeding—involves operating the engine at a higher speed. Running the engine faster and adjusting the gearing in the transmission to increase the ratio of engine rpm to wheel rpm make it possible to use less engine torque in the gasoline engine to achieve the same torque at the wheel as in the diesel. That reduction in engine torque further reduces the need for ethanol. Power versus engine speed in the three engines These curves show the power delivered at various engine speeds by the three engines: a conventional 12-liter diesel (blue), the 6.7-liter gasoline-alcohol engine (red), and the reduced-torque version of the 6.7-liter gasoline/alcohol engine with upspeeding (green). The diesel operates at a maximum speed of about 1800 rpm, with a maximum power output of about 300 kW. The gasoline-alcohol engine can run at a far higher speed and power output, but it would require relatively large quantities of alcohol to prevent knock. The upspeeded gasoline-alcohol engine produces less power, but at an engine speed just over 3500 rpm, its power output matches the maximum power produced by the diesel. Because it runs at lower torque, its alcohol consumption is relatively low. The figure above shows engine speed versus power in three engines: the 12-liter diesel engine (the blue curve), the 6.7-liter gasoline-alcohol engine (red curve), and the upspeeded, low-torque, gasoline-alcohol engine (green curve). The diesel engine can operate up to only about 1800 rpm, at which point it generates about 300 kW of power. The gasoline-alcohol engine can run at much higher speeds and deliver far more power—but ethanol consumption would be high. In contrast, the low-torque gasoline-alcohol engine delivers less power at lower rpm, but running at about double the speed of the diesel and using appropriate gearing, it would provide the same power to the wheels. Further analyses suggest that using upspeeding in a long-haul, heavy-duty engine could reduce efficiency by a few percentage points, but the impact on ethanol use would be dramatic. Ethanol use over a driving period could drop to less than 10% of the total fuel consumed—an amount that could be supplied by onboard fuel separation. Cohn points out one more benefit of the gasoline-alcohol SI engine: It’s a pathway to reducing GHG emissions. “A somewhat under-recognized aspect in evaluating the environmental impacts of transportation vehicles is that GHG emissions from trucks worldwide will overtake GHG emissions from cars sometime between 2020 and 2030,” he notes. D. Cohn and L. Bromberg. Dual-Fuel Gasoline-Alcohol Engines For Heavy Duty Trucks: Lower Emissions, Flexible-Fuel Alternative To Diesel Engines. Society of Automotive Engineers paper no. 2018-01-0888. April 2018.